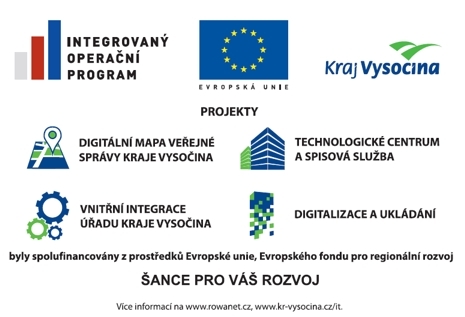 ROWANet Free is operated free of charge for all residents and visitors to the Vysočina Region as a short-term narrowband connection. It is not a substitute for full-fledged Internet access, for example at home. To obtain full functionality, you must complete the form that is displayed when you open your Internet browser. Your connection will be limited to 3 hours a day and to a maximum of 256Kbit/s. ROWANet Public is operated free of charge for all residents and visitors to the Vysočina Region as a "conference connection". The connection only functions in conference and meeting premises, not in public outdoor places such as squares, railway or bus stations, etc. The connection is limited to a maximum of 2Mbit/s. ROWANet Private is designed for the employees of municipalities and is used by the IT staff of individual municipalities and organisations subsidised and established by the Region. eduroam is an academic roaming system that provides network connectivity for its users in connected organisations. Access is based on secured authentication in the home institution. For a list of the institutions connected, see http://www.eduroam.cz/doku.php?id=en:start .